Cornas is situated directly south of St. Joseph, and to the west of the river Rhône. It is 12km south of Tournon and directly east of Valence. Importantly, temperatures here are hotter than Hermitage, which is only 7km away. 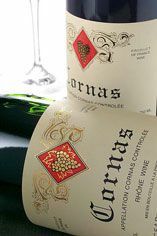 Cornas is a small appellation located in a south-facing semi-ampitheatre with granite-rich soils. The appellation was established in 1938 and only red wines are made, produced solely from the Syrah grape. A contributing factor to the style of the wines is the granitic soil; the wines are made traditionally and often spend two years in oak. They are also strong and powerful – a cross between Hermitage and Côte-Rôtie, but typically displaying less elegance and finesse. They tend to be much more serious wines than either St Joseph or Crozes-Hermitage, however. Cornas can have a slightly raw and rustic side to them. Young Cornas can be deep and dense, almost pitch black in colour and ferociously tannic. After five to 10 years of ageing the best examples take on a more elegant and complex character, marked by aromas of sous bois and wild animals.